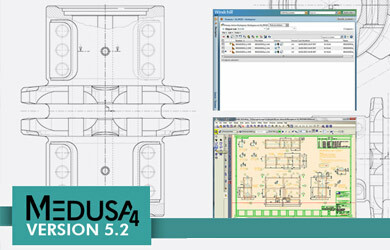 Cambridge, UK and Pittsford, NY – 8 August 2013: CAD Schroer has just released version 5.2 of the MEDUSA4 2D/3D CAD suite and its 3D plant design system. The release features a new Windchill® PDMLink™ Workgroup Manager for MEDUSA4, new dynamic design tools and enhanced data exchange options. This version introduces the new Windchill Workgroup Manager for MEDUSA4, developed in partnership with PTC to ensure continued integration with future releases of Windchill PDMLink in a homogeneous data management environment. 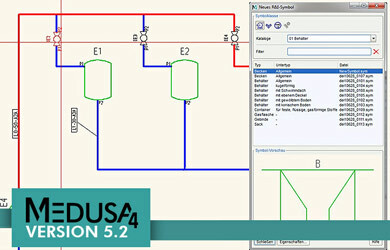 A free treat for maintenance customers with the MEDUSA4 ADVANCED package is a new feature which allows designers to check out software licenses for use off-network – at home or at customer sites. 2D users will see a series of productivity enhancements in the Smart Drafting and Dimensioning tools. The latest P&ID module offers a new configuration tool for administering symbol libraries and attributes, as well as element selection enhancements. The MEDRaster module for integrating and editing images in CAD sheets now benefits from the latest raster editing technology supported by ImageMagick. New flexible 3D data exchange and colour mapping options include bi-directional 3D DWG conversion. The CADConvert interface now supports the AutoCAD® file format from AutoCAD R 12 through AutoCAD 2013. 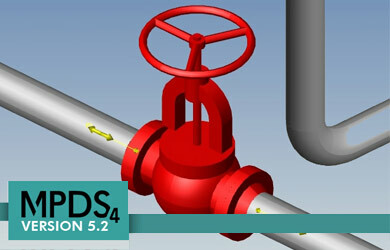 MPDS4 PLANT DESIGN offers new functionality for fast and intuitive routing of pipes, ducts and conveyors, dynamic design editing, and intuitively moving components in assemblies, as well as new parametric equipment design and loading functionality. New tools and options for creating uneven floors with the Factory Layout module are also provided.